I love makeup brushes. I love to hoard collect makeup brushes. I don't know what it is, they are like soft little pets that I don't have to feed or walk. I do have to keep them clean but they pay me back for my tender attentions by applying my makeup and looking pretty on my dressing table. 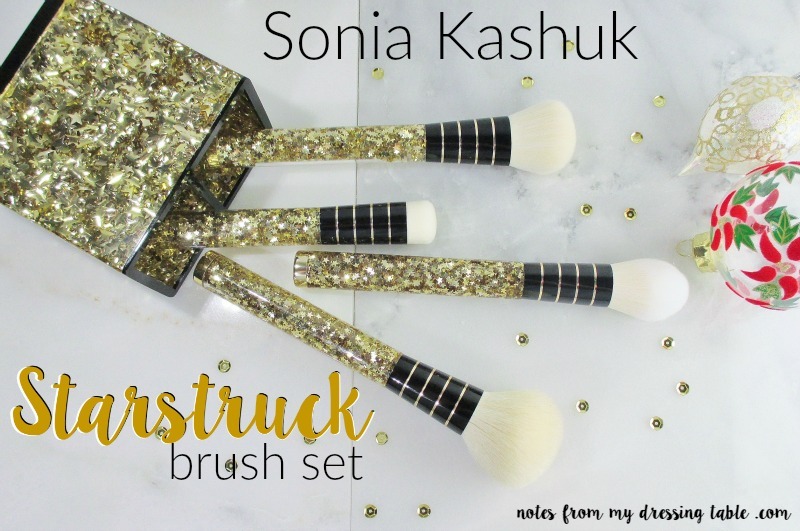 My most recent brush acquisition is the Sonia Kashuk Starstruck 4 Piece Brush Set. 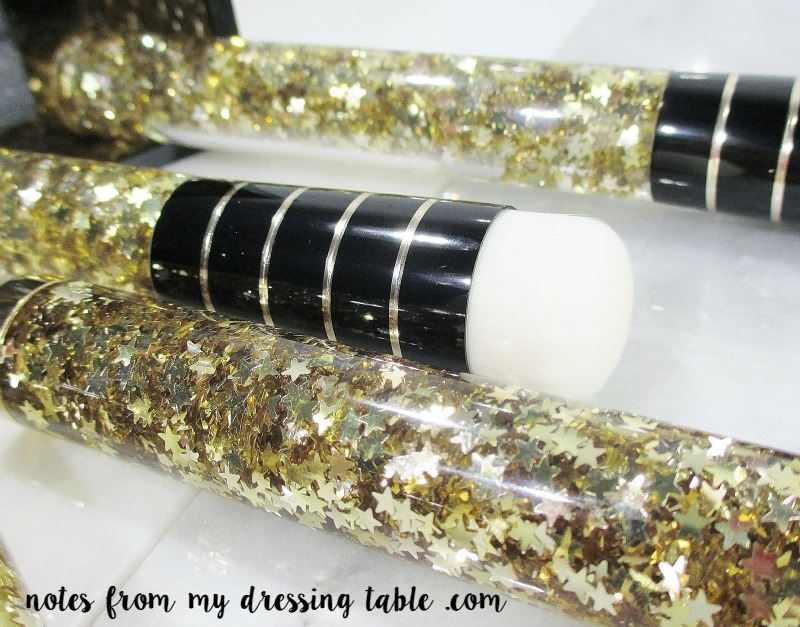 These amazingly soft, even trimmed white brushes have gold trimmed black ferrules and glassy smooth acrylic handles embedded with tiny gold stars. Okay, the Target website says that these brushes are goat hair. I think that all four brushes are natural hair bristles but I can't say for an absolute certainty. I am an idiot and didn't safeguard the box these brushes came in and my husband tossed it before I could get all of the info I needed off of it. Tech me to leave something out in his path. I swear to God, that man makes Felix Ungar look like a raging slob. So I'm guessing on a few things but it's makeup brushes, not national security so I don't think that anyone will be too bothered by my faking it a bit. 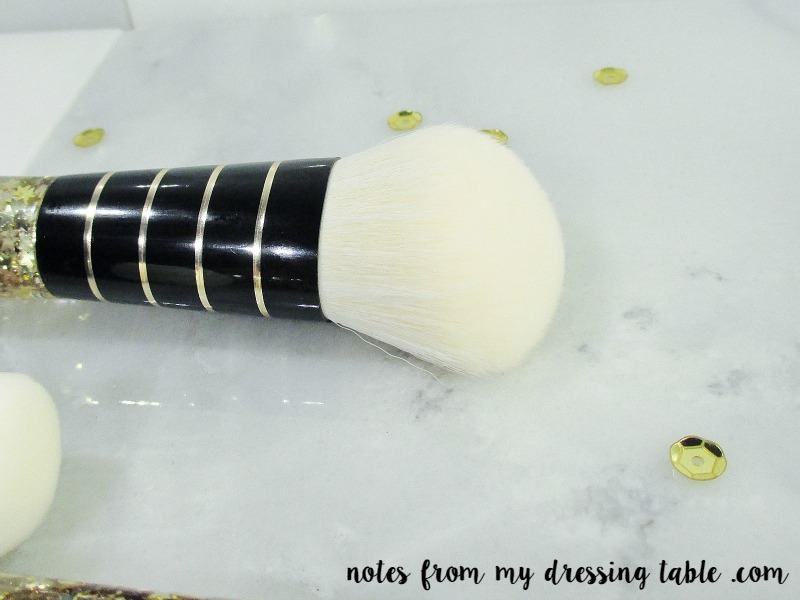 The Powder Brush is a medium/large goat hair bristle brush that is a soft, aged ivory tone. 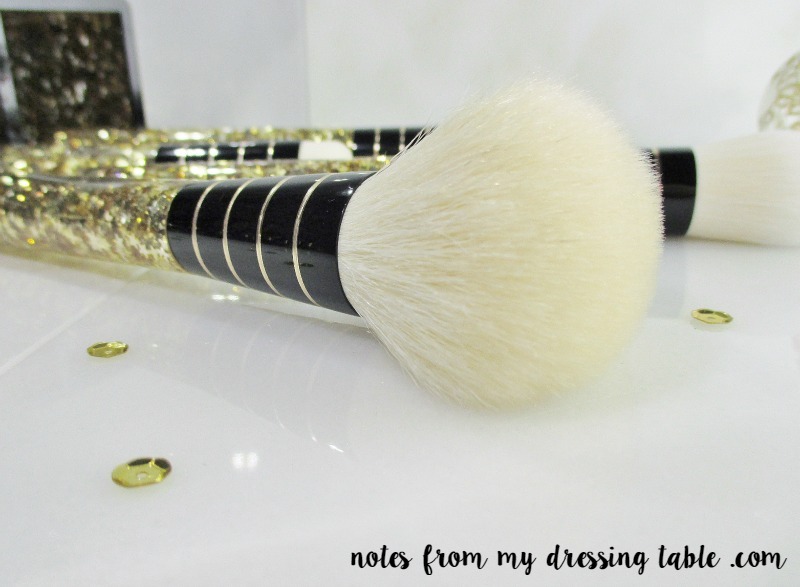 This brush is surprisingly soft for a drugstore makeup brush and is a step up in quality for this brand. This brush is full and quite densely packed yet flexible enough to do it's work without disturbing the foundation under it. It's lovely for powder and bronzer. I'm calling this a Medium Tulip Brush. This brush is very soft yet dense. The bristles are flexible but not floppy. 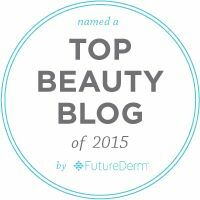 This is great for contouring, highlight, even blush. I named this one the Baby Buffer. This firm,densely packed little brush is trimmed to a gently domed shape and is slightly larger in diameter than the handle. This can buff or stipple concealer, contour, even a wash of shadow on the eyes. Angled face brush. 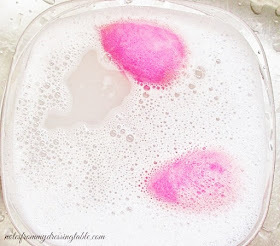 This one can buff on foundation, apply blush or bronzer to a nicety. The brush is soft, fairly dense but still flexible enough to be versatile. I had a brush similar to this, years ago that I wrecked by standing it upright to dry after I washed it until it fell apart. I really liked that brush. I think I like this one as well. See the wavy little hair coming off of this brush? Looks like natural hair, to me. The end cap detail on the brush handles. Sleek gold with the Sonia Kashuk logo in black. 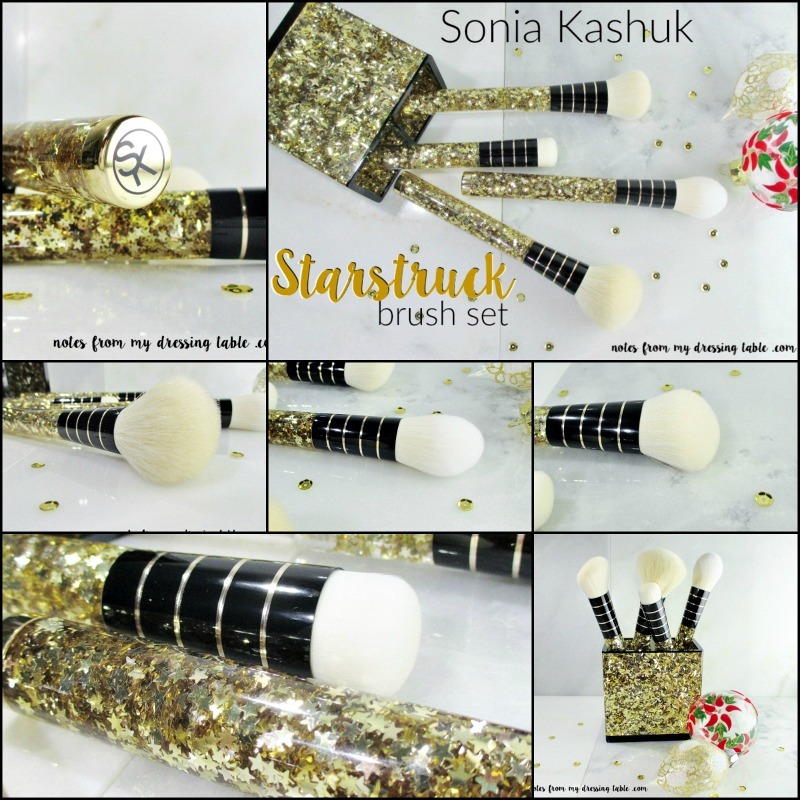 The Sonia Kashuk Starstruck 4 Piece Brush Set is well made, incredibly cute and a good deal at $29.99. There is a matching Rising Star Brush Cup with larger stars set in acrylic and trimmed in black for $12.99. 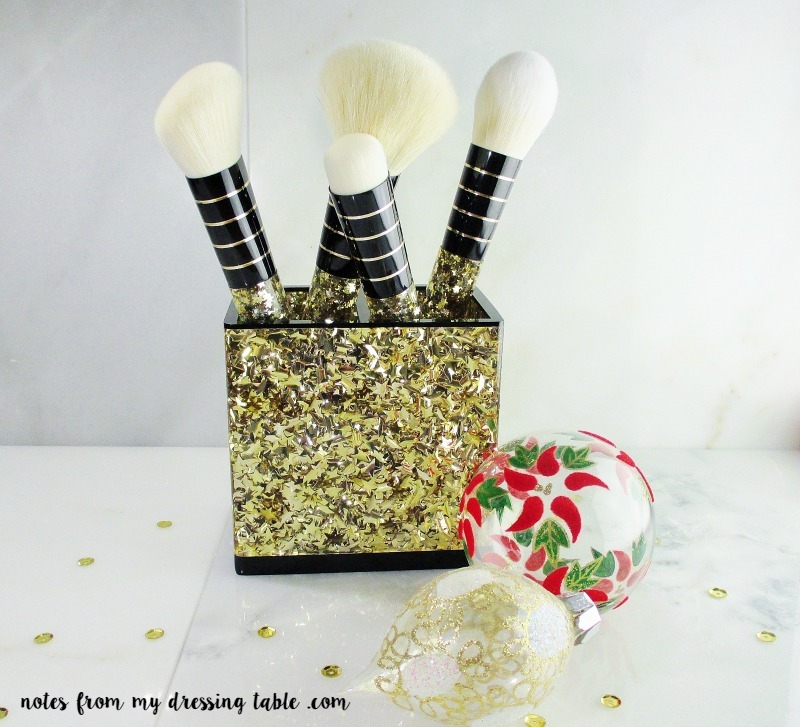 The two items together would be a lovely gift for the makeup lover in your life or for yourself. If you are ordering this online, don't forget to use Ebates to save a little more on your purchase. 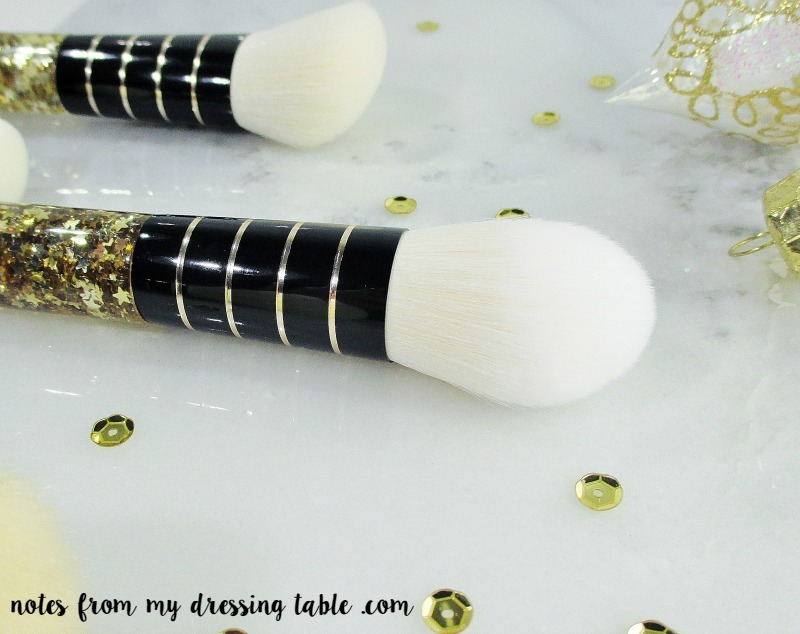 Are you a Sonia Kashuk makeup brush fan? Are you as susceptible to the lure of these limited edition brush sets as I have proven to be? Which is your favorite set?